Articles What's In A Name???? 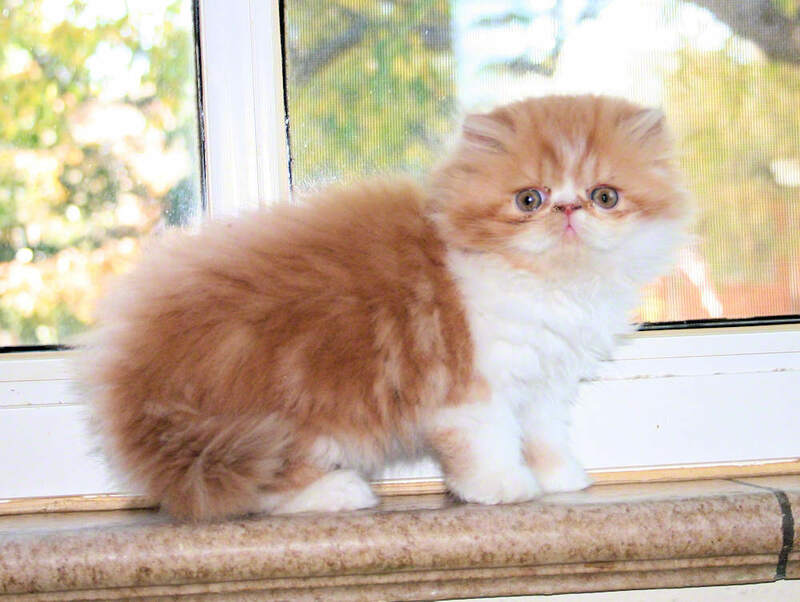 Registering a pedigreed kitten with the Cat Fanciers' Association ("CFA") is imperative to a breeders goals as a show cattery. 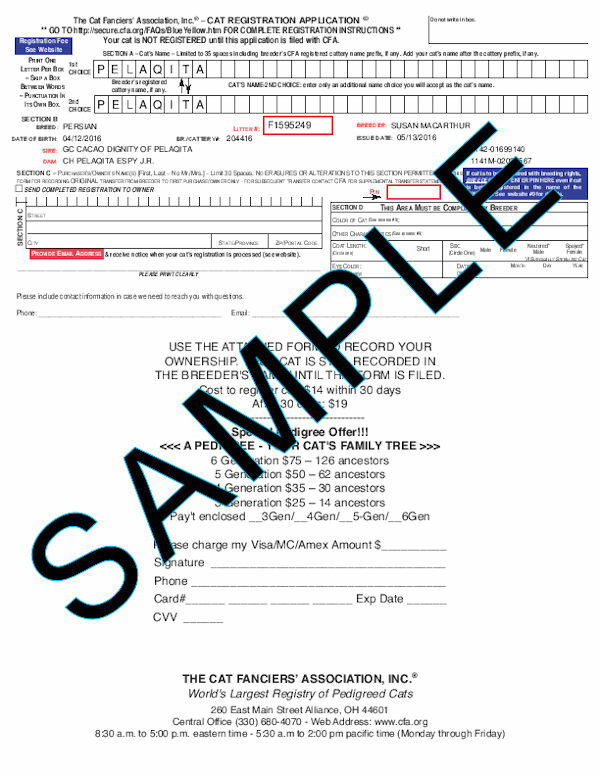 Many pet buyers never send in the registration papers to the CFA. Not registering your kitten directly affects our goals as a breeder as well as negatively impacting the CFA and its ability to fund the many programs that benefit cat owners and cat breeders. As you can see in the example above, there are spaces for letters of a registered name. The breeder's registered cattery name is always listed as a prefix, and no one can change that. A registered name can be up to 35 characters (alphabetical, numerical, punctuation, and spaces between characters). The breeder's registered cattery name is subtracted from the 35 character allowance. For example, our cattery name is "Pelaqita" so a kitten owner would have 26 spaces for the registered name portion, including spaces. Unless an owner is a registered CFA cattery, a kitten's registered name may not end in "of [insert any name]". For example, "Pelaqita Black Jack of Smith". The CFA reserves the words "of [insert name]" for registered catteries. So that when a breeder purchases a cat from another breeder they can add their cattery name on to the end of the cat's registered name. When Pelaqita Persians purchased Diggie from Cocoa cattery, his registered CFA name was "Cacao Dignity". When I sent in the registration certificate to transfer ownership, his registered name became "Cacao Dignity of Pelaqita". Naming a kitten is a personal matter and many times new owners want to take some time to get to know their kitten and its personality before naming it. However, a registered name is for CFA registration purposes only. Often, a registered name is not what the kitten is called on a day-to-day basis, which is referred to as a "Call Name". In fact, a registered name rarely has anything to do with the call name. For example, we had a German Shepherd dog many years ago whose registered name was "Chenoa's Great Adventure". However, her call name was Rhini, no correlation between the two. MayMay's registered name is: "Pelaqita Mrs. C" as we were going to call her Marion (from the Happy Days show). Kitten's registered name, date of birth, color and registration number. The registered name and registration number of the sire and dam of the kitten. The recorded owner of the kitten. The recorded breeder of the litter. If an owner does not register their kitten with the CFA, as far as the CFA is concerned, the kitten still reflects the breeder as the owner. Furthermore, if an owner ever decides to re-home the kitten this registration form is needed in order to transfer ownership of the kitten to the new owner or back to the breeder. 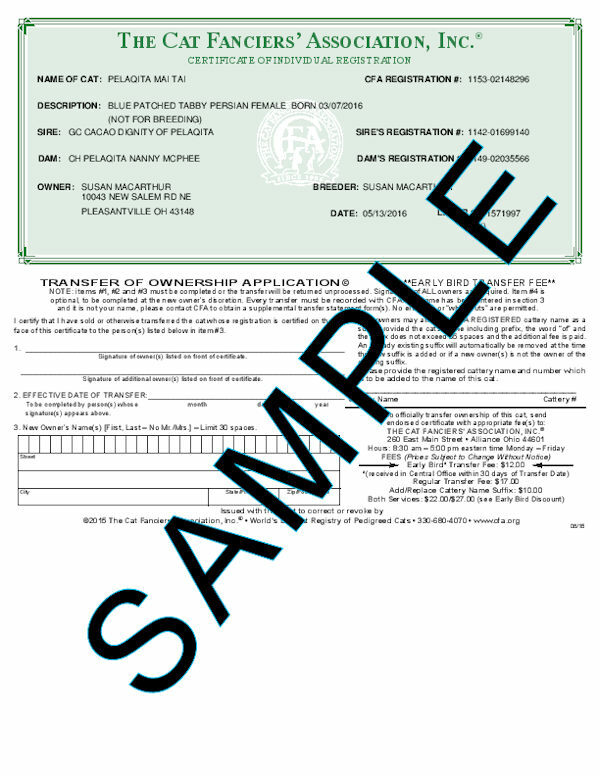 Sample of Certificate of Individual Registration Certificate. Why Register your Pedigreed Cat? Donating monies to the Winn Feline Foundation, which funds research into feline related diseases and other feline health issues. Legislation - Involvement in legislation matters that affect cat owners and breeders. The CFA Legislative Group provides guidance to those individuals or member clubs who are opposing unreasonable animal control legislation in their geographic area. The committee members review and analyze proposals, offer opinions, and provide information to those working to overcome the pressure to limit and control the activities of pedigreed cat breeders as a way to end what is termed "Pet Overpopulation". Breeders' Assistance Program, which aims to help and support breeders, who find themselves in an out-of-control situation, by making assistance available through other breeders. Animal Welfare Committee, which funds the cattery inspection program, and the CFA's commitment, worldwide, to rescue and aid cats displaced during disasters. The Trap, Test, Vaccinate, Alter, Identify, and Release Program for managed feral cat colonies, the CFA's promotion of responsible pet ownership and public education, their dedication to present the most beautiful cats in the world to the public, and their quest to constantly do the "right thing". Mentoring program which assists new breeders or first-time cat show exhibitors. Ambassador program which helps exhibitors give a public face to the cat fancy at cat shows and other events. Youth Feline Education Program engages youth from 7 to 18 in activities from drawing a poster, to doing a breed presentation, to working on a show committee, to taking a therapy cat to visit a hospital unit. The program is designed to allow youth to enjoy the cat fancy and excel at their pace through the activities and age categories while enhancing their appreciation for felines and feline inspired professions. A kitten buyer will have to decide on a registered name at least two weeks before the scheduled date for the kitten to go to its new home. Pelaqita Persians will register that kitten with the CFA with that registration name, and it will reflect the kitten buyer as the owner. If a kitten buyer is unable to think of a name, then Pelaqita Persians will choose a registered name for that kitten and registered it with the CFA. The certificate will reflect the new owner's name and the kitten's registered name. I can’t find your application page. Can you help?